STEP INTO THE SPIDER-VERSE WITH A CADRE OF SPIDER-HEROES! With his ability to traverse the Multiverse, SPIDER-MAN assembles a team to track down a loose end from his past: the fate of the mighty GOG! 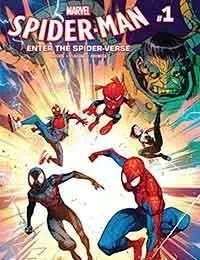 Get ready for the upcoming film with this standalone adventure featuring some of your favorite Spider-Heroes: PETER PARKER! MILES MORALES! SPIDER-HAM! SPIDER-GWEN! SPIDER-PUNK! Also featuring a special presentation of SPIDER-MAN (2016) #1 — Miles Morales' first adventure in the Prime Marvel Universe!